Heat the oven to 350°F. Spray a 2-quart shallow baking dish with vegetable cooking spray. Place the stuffing into the dish. Sprinkle the cranberries over the stuffing. Beat the eggs, milk, sugar, applesauce and vanilla extract in a medium bowl with a fork or whisk. Pour the milk mixture over the stuffing mixture. Stir and press the stuffing mixture into the milk mixture to coat. Let stand for 20 minutes. Bake for 40 minutes or until a knife inserted in the center comes out clean. Serve warm with Brandied Butter Sauce (see recipe below). Brandied Butter Sauce: Heat 1/2 cup (1 stick) butter in a 1-quart saucepan over medium heat until the butter is melted. Add 1/2 cup packed light brown sugar. Cook and stir until the sugar dissolves and the mixture is hot and bubbling. Remove the saucepan from the heat. Whisk in 2 tablespoons brandy. Makes 1 cup. 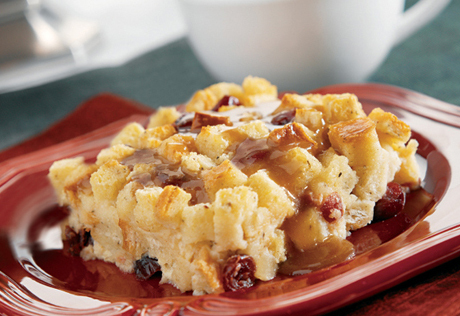 Tip: Both the bread pudding and the Brandied Butter Sauce can be prepared in advance. Prepare the pudding as directed but do not bake. Prepare the sauce as directed above. Cover the pudding and the sauce and refrigerate for up to 24 hours. Bake the pudding as directed above. Microwave the sauce in a microwavable bowl on MEDIUM for 1 minute or until hot.